Julius Malema’s and ruling party officials’, devotion to a particular ‘freedom song’ is both confusing and biblically offensive. Which should rate higher on any public servants agenda – to preserve a song about killing farmers because long ago freedom fighters sung it, or to refrain from anything that breaks down rather than build national unity and health? I don’t need to even comment on the first six, because the seventh is an indictment on anyone who champions the singing of a song about killing anyone, let alone the very people who feed the country. Singing ‘kill the Boer’ is offensive, divisive, dangerous and thoroughly contrary to biblical teaching. 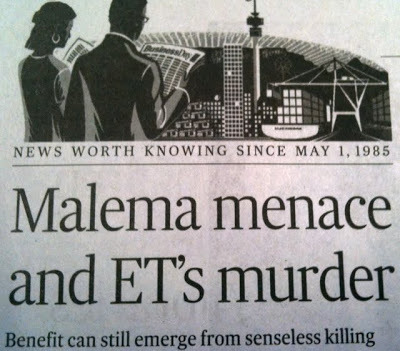 I wrote this several days before the heinous murder of AWB leader Eugene TerreBlanche. I don’t want to reduce a matter of such potential gravity to the arena of politics, let alone racial politics. However, I do want to point back to the biblical standards against which God holds all of us accountable. He hates ‘hands that shed innocent blood’, He hates wicked schemes, evil, and false witness. Almighty God hates the stirring up of dissension among brothers… and so should we. The way of Jesus is the way of love and truth, and everyone who professes to revere His name should follow His ways in both words and actions. God have mercy on us, and may men and women of God rise up in our day to proclaim and practice truth and love. So, no more rabble rousing and songs that create a culture of violence! And, no retaliation from those who perceive themselves to be victims. It is not possible to ignore politics in all of this and I have much to say on that topic and on individuals who seek to elevate only themselves, however, Chris posed the challenge that we should place our Heavenly Father’s example of “Love & Truth” foremost. A massive challenge in a overly politicized South Africa in these days, where love and truth signifies weakness. I would argue that one should keep it simple. The acronym KISS would not be out of place in this context, but in fear of offending someone with the words “keep it simple stupid”, suffice it to say that less would be more in this case, so spelt KIS. Proverbs 15:1 tells us that a soft response turns away the wrath and equaly Proverbs 18:7 says that a fools’ mouth is his undoing, and his lips are a snare to his soul. – we clearly have many contenders for the title of “fool” in South Africa. What should a Christians’ response be then to this challenge – Silent and strong, loving and kind comes to mind. A lifestyle which is different and which stands out, one which would make others want to aspire to it. Sadly, there is another side to a positive approach in an otherwise negative society – and this is not a surrender or being pesimistic; the question is, what do Christians do when all else failed, when the masses follow all the pathes that leads away from God? The Bible says we should walk away, shake the dust from our feet. In this instance I’m reminded of the story of Lot. I wonder, could it be possible that we are perhaps nearing such a stage not just in South Africa, but in the world?